In early March, Michigan state senators took the first step toward preparing a work requirement proposal of their own by introducing Senate Bill 897. The bill passed the Michigan State Senate on April 19. 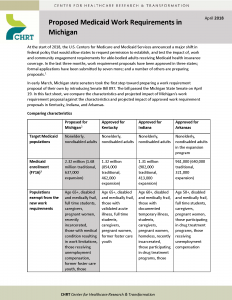 In this fact sheet, we compare the characteristics and projected impact of Michigan’s work requirement proposal against the characteristics and projected impact of approved work requirement proposals in Kentucky, Indiana, and Arkansas. To read the full brief, click on the image above.